Genetic engineering is the technique of biotechnology which helps in preparing recombinant DNA. Recominat DNA (rDNA) is a form of artificial DNA that is created by combining two or more sequences that would not normally occur in nature. There are three main methods of genetic engineering which are the plasmid method, the vector method, and the biolistic method. This method is the most commonly used method in genetic engineering. This method uses small circular pieces of a DNA molecule called plasmids. This method is mainly used for altering microorganisms such as bacteria. 1) The plasmid is inserted into a container containing restriction enzymes. Restriction enzymes cut up the plasmids into small pieces. 2) Using the restriction enzymes, these cut pieces of plasmids are inserted into the bacteria and due to which sticky ends are produced. A sticky end refers to how the restriction enzyme cut the DNA. If the cut was straight then it is a blunt end, but if it is a staircase than its sticky. 3) The sticky ends on the DNA from the plasmids combine with the sticky ends on the DNA inside the bacteria to form a ring of DNA. Other enzymes are added to make those ringed DNA molecules more stable. After they stabilize, they are put in safety to use for further processes. 4) A culture of live bacteria is then prepared with the newly formed plasmids and are placed together. These plasmids will then enter into the bacterial cell and start expresses itself. During the expression, the plasmid will synthesize new proteins or antibiotic resistance genes. These new genes will help distinguish the plasmid bacteria from the non plasmid bacteria. The vector method uses techniques similar to the plasmid method. This method uses vectors, which are small carrier molecules, which are normally viruses. Viruses are made of a protein capsule and have their DNA inside, they attach onto a cell then inserts its DNA or RNA into the host cell, then it detaches itself. The DNA, now inside the host cell, will start replicating itself by using the genetic information of the host cell, which means the gene that was inserted will now be part of the host cell. The vector method is better than the plasmid method because the plasmid method offers genetic variation because the newly formed plasmids are made with random pieces of DNA, while the vector method uses a specific gene to get a specific result. This will make the host give the desired features. 1) The strand of DNA is put into a container with specific restriction enzymes to separate a specific gene. Once the restriction enzyme cuts the gene of interest, that gene is then isolated from the rest and is ready to be inserted into a vector. 2) This gene is now inserted into a vector, in this case its a virus, and once the virus has accepted the gene of interest, it becomes a recombinant molecule. A recombinant molecule is just a vector with recombinant DNA attached. 3) The vector is now placed with the host cell, where it transfer the DNA to the cell. Once inside the cell the DNA starts to replicate, scientist then stop the vectors own DNA from replicating and only allowing the gene of interest to replicate. 4) The gene is now inside the host cells DNA and now the cell will have this gene. The biolistic method is also called the gene gun method, and like its nickname this method uses a gun. 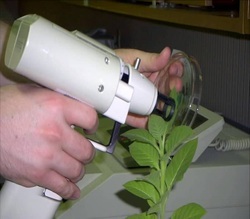 This method is mainly used for the engineering of the plants, although the science is evolving to do animals as well. 1) DNA can become "sticky" under certain conditions allowing it to adhere to abiotic particles such as metals. They normally use tungsten, gold or silver. These metals are extremely small particles, which are now coated with DNA. 2) The particles are placed inside the gene gun and a partial vacuum is created between the target tissue and the gun. 3) The particles are then fired at the target and the DNA is effectively introduced to the cells.